: Breed is of ancient and pure origins, oldest of sporting gundogs; original purpose was finding and springing game for net, falcon or greyhound. Now used to find, flush and retrieve game for gun. : Symmetrically built, compact, strong, merry, active. Highest on leg and raciest in build of all British land Spaniels. : Friendly, happy disposition, biddable. Timidity or aggression highly undesirable. : Of medium length, fairly broad, slightly rounded, rising from foreface, making a brow or stop, divided by fluting between eyes, dying away along forehead towards occipital bone which should not be prominent. : Foreface of proportionate length to skull, fairly broad and deep, well chiselled below eyes. : Fairly deep and square. : Medium size, almond-shaped, not prominent nor sunken, well set in (not showing haw), alert, kind expression. Dark hazel. Light eyes undesirable. : Lobular, good length and width, fairly close to head, set in line with eye. Nicely feathered. : Good length, strong and muscular, free from throatiness, slightly arched, tapering towards head. : Strong, neither too long nor too short. : Muscular, strong with slight arch and well coupled. : Deep, well developed. Well sprung ribs. : Forelegs straight and well boned. : Sloping and well laid. : Set well to body. : Tight, compact, well rounded, with strong, full pads. : Hind legs well let down. : Broad, muscular, well developed. : Moderately bent. Coarse hocks undesirable. : Strictly his own. Forelegs swing straight forward from shoulder, throwing feet well forward in an easy free manner. Hocks driving well under body, following in line with forelegs. At slow movement may have a pacing stride typical of this breed. : Close, straight and weather resisting, never coarse. Moderate feathering on ears, forelegs, body and hinquarters. 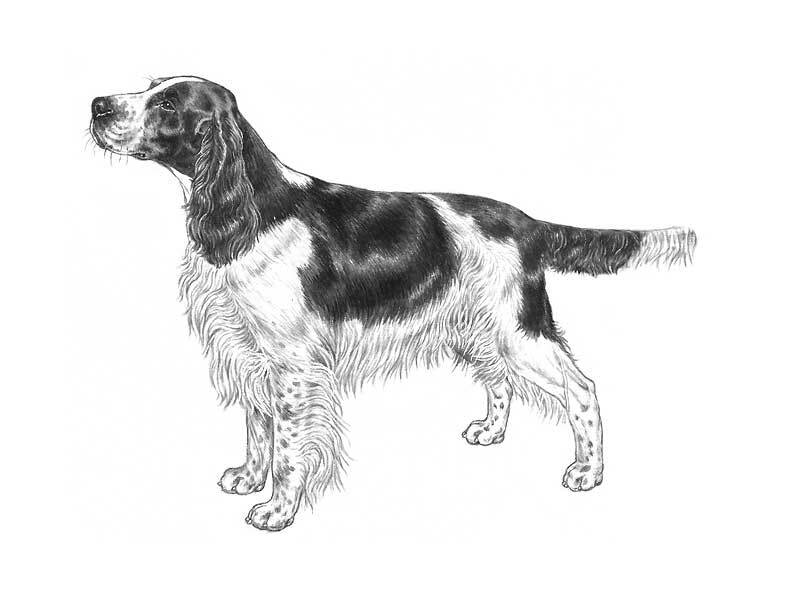 : Liver and white, black and white, or either of these colours with tan markings. : Approximate height at withers 51 cm (20 ins).